How’d you sleep last night? If your answer is anything less than fantastic, your diet could be the problem. The good news is, there’s something you can do about it today. Research has shown that small changes to your diet can dramatically improve how well you sleep. Adults need seven to eight hours of sleep each night to stay healthy. An inadequate sleep regime has been linked to a host of health problems including diabetes, cardiovascular disease, and mental health issues among others. The bottom line is: the number of hours you sleep is just as important as the almighty number on the scale when it comes to your overall health. Eating small, nutritious meals throughout the day is the best way to ensure a peaceful slumber. If you expect to have a great night’s sleep after eating a four-course dinner at 8 p.m.—you’re dreaming! Your body will wage war with you all night long because you’ve eaten too much, too late at night, and now it must work hard to digest, use, and store the barrage of food. So, no, a restful sleep is not in your future; more like a night of tossing and turning thanks to heartburn and indigestion. Try this instead: Prepare healthy snacks and on-the-go meals so that no matter what the day throws your way, you can have something ready to keep your diet on track. Eating small, regular amounts of food during the day gives your body the fuel it needs, so you don’t overeat later to compensate for missed meals. If you must eat late, reach for vegetable and protein options instead of foods filled with carbohydrates, sugar, and saturated fats since those are the main culprits of indigestion and heartburn that can keep you up at night. Coffee is not your friend before bedtime if you want to sleep well at night. According to the National Sleep Foundation, drinking more than three 8-ounce cups of coffee a day may impact sleep. Your body needs time to metabolize caffeine and that process can take up to eight hours. For most, this doesn’t mean passing on coffee altogether; you just need to give your body enough time to handle the caffeine before bedtime so politely decline that post-dinner cup and your reward will be a restful sleep. You can instead look forward to your morning cup and the caffeinated boost it provides first thing in the morning when you need it, not late at night when you don’t. Try this instead: If you still need that nightly warm cup of comfort to wind down, try a decaffeinated tea. There are a variety of decaffeinated flavors available, and some may even help encourage sleep like chamomile tea or the passion fruit-flavored variety. Research has shown drinking these kinds of tea provide your body with chemicals like glycine and Harman alkaloids, which can help calm your nervous system. Many people are surprised to learn that their after-dinner treat may be the reason they can’t sleep hours later. When you eat something sweet, your blood-sugar levels rise giving you an energy boost you don’t want right before bedtime. This doesn’t mean you must eliminate sugar from your diet to sleep; you just need to be mindful regarding the time you decide to indulge. Try this instead: If you don’t want to give up a nightly treat —try finding something new to replace it. Ideally, your indulgence should be between 150-200 calories and have some protein in it. An apple with a tablespoon of peanut butter, whole wheat toast with almond butter, or a half cup of Greek yogurt are all good choices to try. You could also drink a glass of water to keep hunger pangs at bay and treat yourself with time to read, watch a show, or some other reward besides eating that nightly sweet. It may not be as satisfying, but it will help you avoid sugar highs that can keep you awake and you won’t miss those empty calories that can throw your diet off track. A nightcap may seem like a great way to unwind after a long day, but it won’t help you sleep more soundly. The effects of alcohol are deceiving because while it may relax your body enough to fall asleep, you probably won’t stay asleep because it can disrupt your circadian rhythm. Even if you do happen to sleep through the night, you will still feel tired when you wake up. That’s because alcohol and other depressants suppress a phase of sleep called REM or “rapid eye movement” which is the holy grail of sleep—it’s when your body sleeps most soundly and most of your dreaming occurs. Try this instead: If you are on a quest to sleep better, the obvious answer would be to not drink alcohol, especially right before bedtime. But since alcohol affects everyone differently, it is up to you to determine if your drinking habits might be impacting your sleep. Studies have shown that two eight-ounce servings of tart cherry juice a day can regulate your sleep thanks to its inflammatory properties. Tart cherries are also full of melatonin, which is responsible for controlling sleep cycles. It may sound like an odd combination, but together they can help calm your nervous system and give you the oil and herb compound your body needs to relax before bedtime. If that doesn’t sound like “your cup of tea,” other sleep-inducing tea varieties include lemon balm and passionflower tea. Milk really “does a body good” served either hot or cold before bedtime. Perhaps, it’s the fond memory of having a warm mug of milk before bedtime as a child that calms the mind and body, or it may be that calcium from a cold glass of milk that helps it prepare for rest. Whatever the reason, milk has been shown to help encourage sleep and is worth a try. Vitamins B6 and B3 can help process tryptophan, an essential amino acid your body uses to produce serotonin, the sleep-inducing chemical needed for restful sleep and a healthy mood. Vitamin B6 can be found in food like bananas, chick peas, poultry, and fish while Vitamin B3 is found in beets, pork, and peanuts. Eating more of Vitamin B-rich foods will help give your body the nutrients it needs to have a solid night of REM sleep. Which of these tips will you try to sleep better tonight? 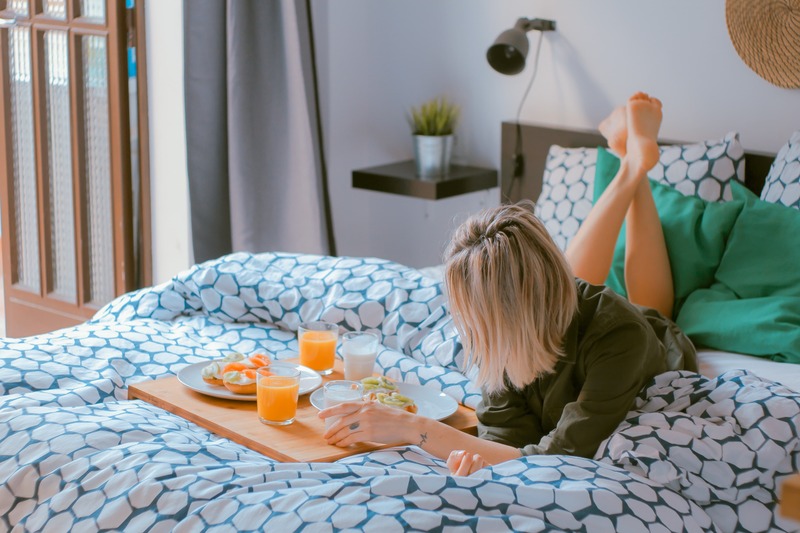 While there is no one-size-fits-all roadmap to a peaceful slumber, you will be surprised how a few small changes to your diet can make a difference.